Cosmetic acupuncture is the latest weapon in rejuvenating the face and repairing it from within. As a safe and non-surgical way, it has becomes a favourite of many stars. Cosmetic acupuncture can diminish fine lines, tighten skin, and improve colour and muscle tone of the face. Along with derma-rolling, it can enhance the result of the treatment. During treatment, fine needles are inserted into specific points on the face. As there is minor trauma caused by needles insertion, it improves blood flow, stimulates cell re-growth and increases production of collagen. Once it is finished, it leaves the face glowing and refreshed. Apart from facial acupuncture, body points are also used at the same time. It can speed up blood circulation and release endorphins for the efficiency flow of energy to and from organs. 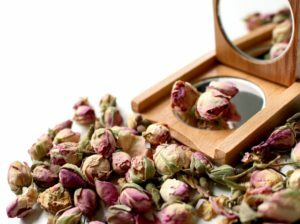 Consequently, it will improve general health and wellbeing, rejuvenating the skin from inside out. The acupuncture session can also be followed by a superficial derma-roller in order to create a series of channels in the skin, allowing the serums that are applied to absorb easily. Professional strength serums in combination with cosmetic acupuncture can stimulate the body to naturally increase collagen and elastin production. Skin will appear firmer, smoother and younger looking after treatment.